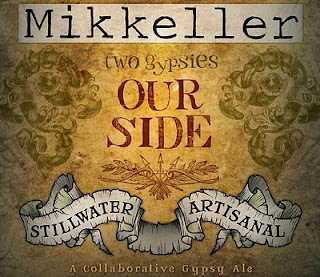 The famed Danish gypsy brewer Mikkel Borg Bjergsø strikes again with this exceptional Saison meets IPA, a collaboration with fellow gypsy brewer Brian Strumke of the Baltimore based Stillwater Brewing. Stillwater initially created a Stateside Saison, itself a terrific Farmhouse Ale with lovely citrus notes. Mikkeller also came out with his own offering, a Stateside IPA. What comes next from the pair both creating beers called Stateside? A beer brewed together where Stateside Saison and Stateside IPA meet one another for a truly unique, brilliantly bright, slightly edgy brew known as “Our Side,” neither Stateside or Europe-side. Mikkeller’s beers are some of the in your face vivid ones currently being brewed. If there is coffee in it, the taste is as present as it is in espresso. The same goes for a fruit centric beer, or one of my favorite flavors in one of his porters, chipotle. Perhaps it’s a Scandinavian influence, but many of his creations are strong in pine flavor. With this terrific, eye-opening mixture enjoyed on draft at the Avenue Pub in New Orleans, the pine flavor is more mild, beautifully balanced with the hoppy nature of an IPA and the citrus from a Saison. Everything connects, just like the two gypsies working together. Teamwork makes invigorating, unique beer. This entry was posted on June 6, 2012 by trevsbistro. It was filed under Beer of the Week .